I’ve mentioned before that I’m an eager reader, but when it comes to how I spend my precious reading time, my tastes tend towards the fiction end of the spectrum (though I generally make exceptions for Bill Bryson ). Occasionally, I will pick up a nonfiction book just to get with the zeitgeist, and understand what all those Slate Articles and Facebook statuses are about, even if I’d rather be reading P.D. James. Here are three that I found worth my time. The Expectation: Sandberg is the COO of a major Internet Company – what does SHE know about my struggles as a working mother? And what if I don’t want to lean in? I thought this would read as out of touch and entitled, the corporate version of GOOP, and many blog posts and articles backed up this expectation. The Reality: Sandberg totally acknowledges all of the naysayers – she knows that she was lucky in her mentors and her opportunities, though her luck was augmented by hard work and seizing the opportunities that came along. Her anecdotes deal with the struggles faced by working women who are invested in both their families and careers – she doesn’t get into the nitty gritty of childcare, but who cares? It’s neither helpful nor interesting to me to know that my friend L, who lives in Texas, has a full-time nanny, but M., in New Hampshire uses a home-based daycare. We all have to work out our own child care situations. She recognizes that many women do want to make the choice to lean out, but she wants to ensure that it’s a choice, and not something women feel like they need to do. There’s a call to make structural changes in the workplace, but also some practical, real world tips on negotiating and being assertive, even for the peons, like me. I ended up wishing I could have lunch with Sandberg and call her up to seek advice every time I have to make a decision at work. we are, sexier than we are – now they’re better mothers, too. I’ve spent a lot of time in France and do appreciate many aspects of French culture (including the absolutely darling children’s clothes), but I was prepared to be deeply annoyed by French exceptionalism in this book. The Reality: There was some French exceptionalism, I’m not going to lie, but the book read as a little more “anthropological study” and and a little less “how to” guide than I expected. There were some fascinating descriptions of the French approach to education (based on the 18th century philosophies of Jean-Jacques Rousseau, for more on Rousseau and how that worked in practice, I’d also recommend reading How to Create the Perfect Wife: Britain’s Most Ineligible Bachelor and his Enlightened Quest to Train the Ideal Mate .) There’s also an in-depth look at the French child-care system (forget what I said above about not being interested in other people’s child care arrangements!) which reinforced some of my own experiences (we love day care). And finally, while all of the descriptions weren’t things I’d want to adopt into my family (I don’t really think babies SHOULD be sleeping through the night at 3 weeks old), or can’t (my kids will not adapt to a 4-times-a-day eating plan), there are some concrete tips that make our family life more pleasant (broccoli as a first course – GENIUS). It’s definitely worth a read. The Expectation: I didn’t have much of an expectation on this one. I never read Dear Sugar and never read Rumpus. I had heard about Cheryl Strayed, but only because my book club wanted to read her best selling memoir, Wild: From Lost to Found on the Pacific Crest Trail (Vintage) , and I was not interested at all. I mean, the only thing more boring than actually hiking is reading about it. (Besides, I already read that book. When Bill Bryson wrote it .) This was available through my library’s e-media portal, and since I’m a fan of Dan Savage and a longtime Dear Abby reader, I figured, why not? We seem to enjoy similar books so I appreciate your reviews. 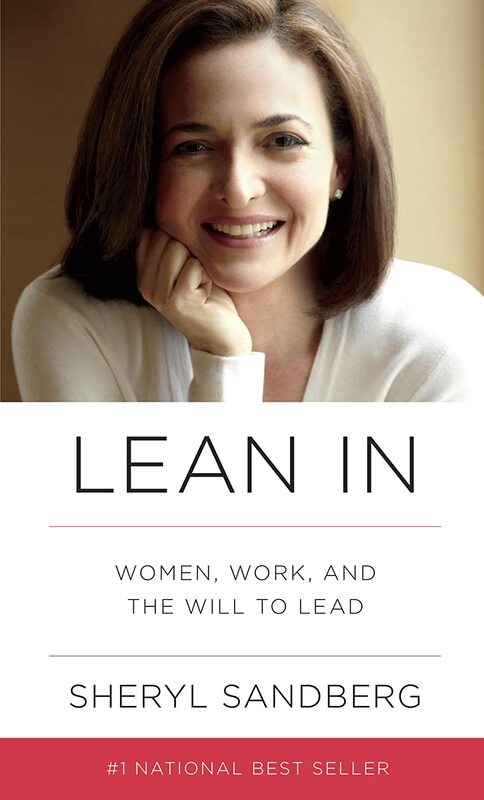 I was “meh” about considering Lean In and now will give it a shot. I already had Bebe on my list, and I now own Tiny Beautiful Things thanks to book club gift exchange, so am eager to read those now too. BUT! What about the book in the photo?? 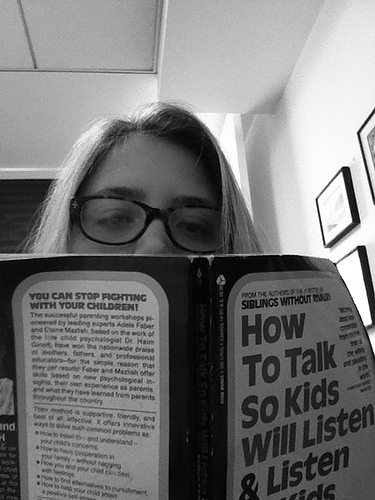 What did you think of “How to talk so kids will listen?” I love parenting books and am curious about this one.